Thanks in part to history and ideology, Cuba -- and especially Havana -- is a treasure trove of architectural styles spanning six centuries. With buildings dating from the 16th through the 19th centuries, Havana is perhaps the most authentic colonial city in the Americas. Since 1982, when the city became a UNESCO World Heritage site, the government has embarked on an ambitious preservation and restoration program concentrated in the Old City. However, a severe lack of funding and materials has hampered efforts. Therefore, the decay and neglect of the past 40 years coupled with the destructive tropical weather continues to claim buildings every year. Most of the architectural styles imported from Europe -- including renaissance, baroque, neoclassical, neo-gothic, the Moorish mudejar and even art deco -- are well represented in Havana and other cities in Cuba in ecclesiastical and civic buildings, and large private villas. Similarly, the Spanish emphasis on urban planning as a complement to colonization can be seen in the precise urban grids and the numerous military fortifications throughout the country. Yet, there are distinctly Cuban elements that developed which are expressed in terms of colors, textures, details, materials, lighting and in the spatial arrangements that address the tropical climate. By the late 19th century, Cuba was educating its own architects and engineers in established university programs and architecture schools; and by the end of World War I, specialized design journals published on the island played the important role of disseminating ideas and providing a forum for the discourse of architectural ideologies from Europe and the United States. Due to a number of converging circumstances, the four decades between 1925 and 1965 saw an unprecedented richness and variety in Cuban modern architecture, not to mention a drastic alteration of the Havana skyline. While the regime, since 1959, has mostly promoted utilitarian architecture based upon the former Soviet model, Cuba today affords a rich variety of architectural and urban planning examples. 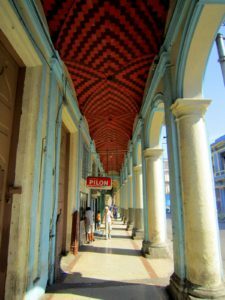 With our direct ties to the Office of the City Historian, the College of Architects, and the most renowned Cuban architects and academics still practicing in the country, Cuba Cultural Travel is well qualified to create specialized architectural tours for individual professionals or academic groups.